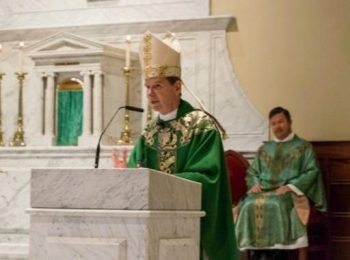 ALEXANDRIA, Va. (CNS) — The Vatican’s Congregation for Divine Worship and the Sacraments declared St. Mary Church in Alexandria a minor basilica, Bishop Michael F. Burbidge of Arlington announced to parishioners during Mass Jan. 14. “It is an extraordinary honor to announce that the Holy See has designated St. Mary’s in Old Town to be the newest basilica in the United States. This historic announcement recognizes the important role St. Mary’s has played in the diocese, the city of Alexandria and even the very founding of our country,” he said. To be named a basilica, a church must have architectural or historic value and meet liturgical requirements, such as an adequate amount of space in the sanctuary and a fitting number of priests. There are only four major basilicas, all in Rome — St. Peter’s, St. John Lateran, St. Paul Outside the Walls and St. Mary Major. There are thousands of minor basilicas throughout the world, including the Basilica of the National Shrine of the Immaculate Conception in Washington, the Basilica of the National Shrine of the Assumption of the Blessed Virgin Mary in Baltimore and the Basilica of St. Mary of the Immaculate Conception in Norfolk. A committee from St. Mary began to research the application process for becoming a basilica last January, according to Father Hathaway. Bishop Burbidge approved the application in June, and sent it to the U.S. Conference of Catholics Bishops’ Secretariat of Divine Worship. USCCB officials approved the plan in July, and sent it to the Vatican’s Congregation for Divine Worship and the Sacraments. In 1788, an Irish aide-de-camp of George Washington, Col. John Fitzgerald, held a fundraiser in his home for the construction of a Catholic church. Washington was the first to donate. In 1795, St. Mary was established as a mission of Holy Trinity Church in Georgetown. Eventually, a church was built on South Royal Street, where the contemporary church stands, and was dedicated by Jesuit Father Francis Ignatius Neale in 1827. Throughout the years, the church has undergone several repairs and renovations. Ministry buildings and offices such as the Lyceum as well as the cemetery are scattered around Old Town. The parish school, one of the largest in the diocese with around 700 students, was established in 1869 after a wave of poor Irish immigrants arrived in the area. Today, St. Mary has 7,100 registered parishioners and dozens of liturgical, fellowship and service ministries. In the near future, the church will be marked with special signage indicating its new status. As with all basilicas, St. Mary will install an “ombrellino,” a silk canopy designed with stripes of yellow and red — the traditional papal colors — and a “tintinnabulum,” a bell mounted on a pole and carried during some processions. “Crossed keys, which are the symbol of the papacy, will be placed prominently on the church exterior,” said Father Hathaway. St. Mary also has designed a seal, which all basilicas have. The symbols within the seal pay homage to the diocese, the Jesuits who founded the parish, and to Mary. In the bottom right quadrant of the shield is a ship, representing Alexandria’s role as an important port town in colonial times. The vessel further represents the frigates that brought Catholic immigrants to the New World. The seal is one of the many ways the new basilica will aim to share its past with visitors. “We will be looking for ways to communicate our significant history and contribution to Catholicism in the commonwealth and beyond through printed guides and other means,” said Father Hathaway. The parishioners at the Jan. 14 Mass applauded the announcement. Sam Lukawski, a fifth-grader at St. Mary School, was one of the 11 altar servers at the Mass. 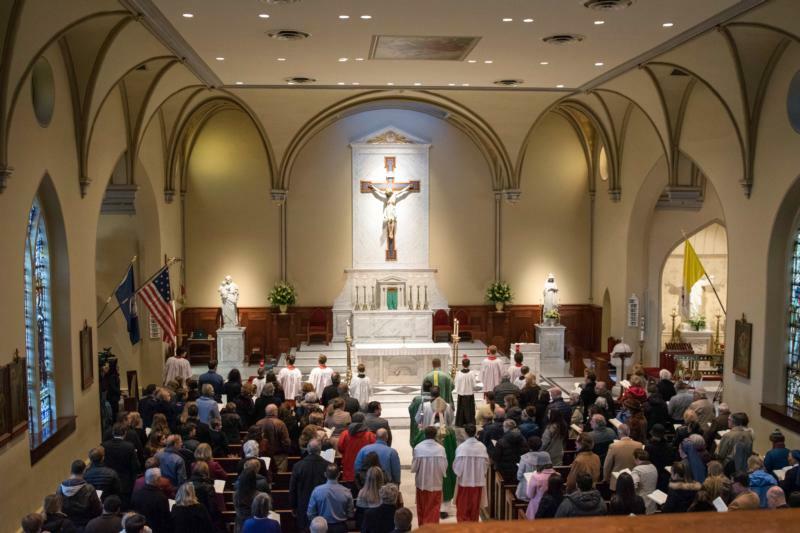 “I was glad that it became a minor basilica and that it’ll be (St. Mary Basilica) instead of St. Mary Church,” he told the Arlington Catholic Herald, the diocesan newspaper. Pat Troy, a longtime parishioner, sent his children to the school and used to host Theology on Tap in his Alexandria bar. He loves the parish for its commitment to Mary, its priests and the fact that it was founded in part by an Irishman. “This was the first time (we) walked down the steps of this historic church as St. Mary Basilica,” he said with reverence. Jonathan Fililpowski and Nicole Hendershot are getting married at St. Mary in April. “We’re excited to be able to get married at a basilica. It’s a beautiful space to come and be able to worship, tied to the roots of our nation,” she said. Deborah and Glenn Cooper were thrilled by the announcement. “I’m so honored to be part of this historic occasion. It makes me want to go back and probe more into the history of the church and also into the whole meaning of being a basilica,” she said. Marist is on the staff of the Arlington Catholic Herald, newspaper of the Diocese of Arlington.